We’d love your help. Let us know what’s wrong with this preview of Just Dad and Me by OneFam. OneFam's interactive father - daughter journal enables you to release the power of your family story. This stunning father and daughter journal is packed full of shared activities with insightful questions, prompts, drawings, lists and lots of free writing space which is sure to strengthen the bond between a father and daughter. Discuss everything from early memories to gr OneFam's interactive father - daughter journal enables you to release the power of your family story. This stunning father and daughter journal is packed full of shared activities with insightful questions, prompts, drawings, lists and lots of free writing space which is sure to strengthen the bond between a father and daughter. Discuss everything from early memories to growing up to feelings about life's situations and interests. A wonderfully fun and simple way for a father and daughter to learn about each other on a much deeper level. 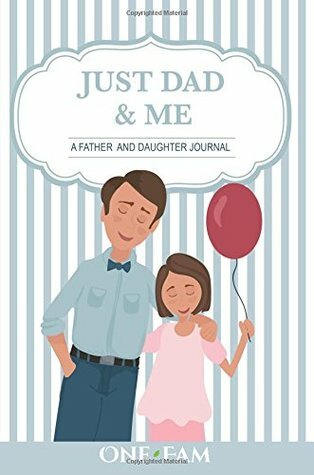 To ask other readers questions about Just Dad and Me, please sign up. The journal provides a great opportunity to create connection with your daughters. I bought this journal during the Christmas time and gave it to daughter as a gift. We have been wrote forth and back every day. I love the idea to build connection between father and daughter. I also really like the design of the book, it divided into two separate section for father and daughter to complete. It provides a lot of useful prompts which makes very easy to share different infor This is a brilliant idea! I bought this journal during the Christmas time and gave it to daughter as a gift. We have been wrote forth and back every day. I love the idea to build connection between father and daughter. I also really like the design of the book, it divided into two separate section for father and daughter to complete. It provides a lot of useful prompts which makes very easy to share different information and stories with my daughter. It is a wonderful way for father and daughter to bond! This is a wonderful and fun parenting tool! I purchased this book in hopes of keeping the line of communication open with my 9 years old daughter. My daughter and I are always close, but this journal allows us to exchanges thoughts and enables me to really see things from her perspective. It is a fun process to complete the journal, it contains many useful prompts, we enjoyed every minutes of it. This is a great book for exploring your fathers to share their life stories with their daughters. There are a lot of prompts that help you to complete the book. The book is in great quality, all paper are in colour and give a nice feel. There are nice blank spaces in the book so personal notes can be written. I have been very busy lately and the book provides the perfect opportunity for me to bound with my 8 years daughter. This is a great gift for any fathers! This book is perfect for father/daughter bonding. Filled with about 60-70 joint activities, it's easy for a father and daughter to spend time together, build trust and get to know one another especially as my daughter is in her early teens. Overall, I could not rate this range or product higher. It's simply a fantastic bonding tool and keepsake for years to come. I bought this journal share stories with my son. A beautiful little book. The jouranl is well designed. The quality is great, all each page is in colour. There are very few simliar products on the market for fathers and children, this is one of the better one. A lovely addition to the bedtime routine. Would highly recommend. This is a beautifully illustrated and composed book. It is a great concept! The book is well designed, and the quality of the book is very good. My daughter and I write every night to each other through this journal. It is perfect gift for all fathers! This is an excellent quality product! It is great tool for Father and Daughter bounding. I am looking forward to complete the journal and go over the journal again with my daughter when she is 18 years old. Great journal for persevering stories !